Guard-All Building Solutions will be exhibiting at the 2018 Association of the United States Army (AUSA) Annual Meeting and Exposition in Washington, DC. The conference is being held at the Walter E. Washington Convention Center on October 8-10, 2018. 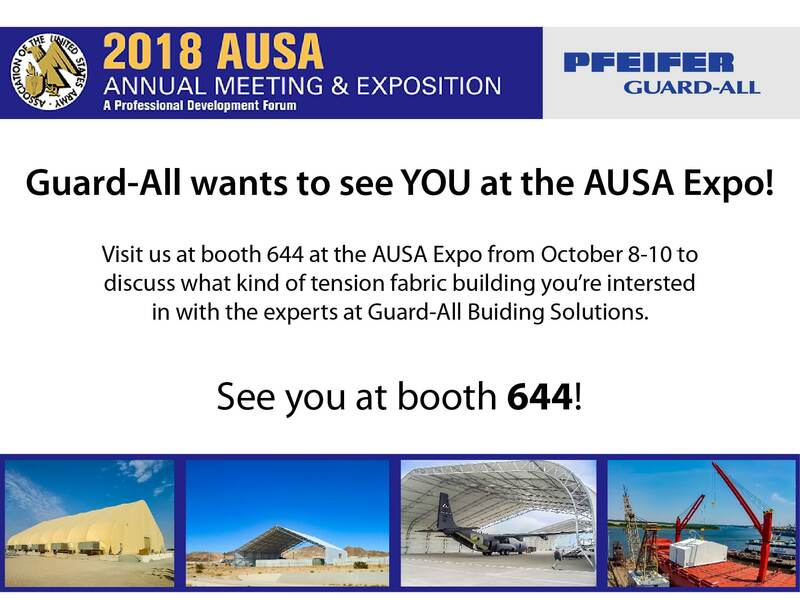 Guard-All will have a trade show display at booth 644 exhibiting the company’s tension fabric building solutions. Guard-All Building Solutions will be providing information on their selection of highly-engineered buildings and aircraft hangars for the military. The AUSA Annual Meeting & Exposition is one of the largest land warfare expositions and professional development forums in the world. This includes more than 500 industry and military exhibits and provides a unique opportunity to showcase important products and services to key Army and DoD decision-makers. Guard-All Building Solutions manufactures highly engineered steel-framed fabric buildings. We produce tension fabric buildings ranging from massive clear span structures to cost-effective temporary buildings. The modular nature of our buildings allows for quick installation, care-free maintenance, easy expansion and the ability to reach any length required. The company’s structures are in use across North America by a wide variety of markets; including industrial, commercial, municipal and agricultural.